Louis Morizot is best known for his collaboration with Sartory. He made bows of all qualities, both uder his own name and for the trade, and his best creations are of the highest quality. This is the sort of bow we look for increasingly – a great example of the particular maker, just the right weight, not too stiff, not too supple, and in perfect condition. It’s an added bonus that this bow is made from remarkable wood and has a very classy oil finish. The stick is of octagonal section pernambuco with a heavy figure – Pierre Guillaume describes the colour as brown orange golden, and I don’t think I can do any better! The mounts are silver and ebony – parisian eye and a plain adjuster of noble dimensions. 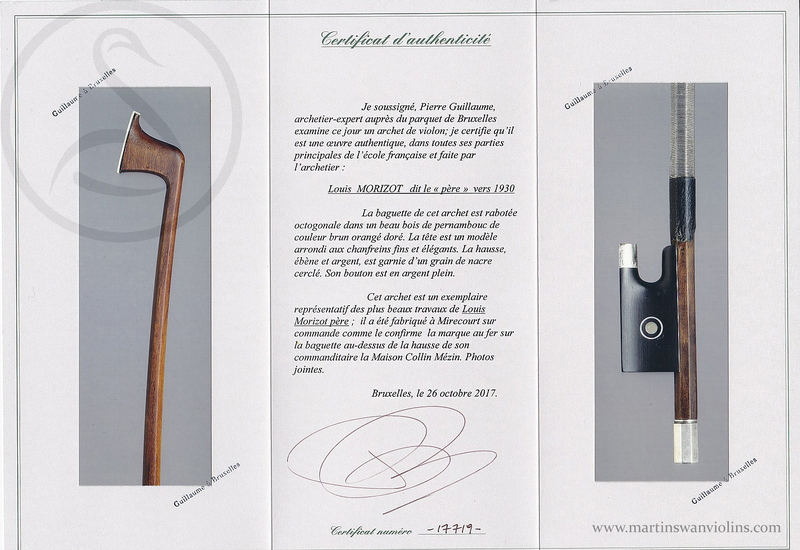 The bow is stamped Collin-Mézin – Louis Morizot supplied them with a lot of bows, but I have the sense that here they were looking for something special. The condition is near mint – there are a couple of scratches on the adjuster but the stick and frog are in fantastic condition. OK I admit it, this is my kind of bow – there’s nothing flashy about the sound, but it’s warm, clean, and to the point. There’s a great feeling of contact with the violin, and it seems very easy to modulate the tone and get what you’re trying for. It’s not a stiff bow, but nor is it weak – it just sits perfectly in the middle of things, and can reach either way. Some people need a “corrective” bow which will modify the things they don’t like about their instrument. This bow won’t do that. But if you are looking for a perfectly balanced stick which can cover a lot of different repertoire and always give an honest account, this bow would be ideal.